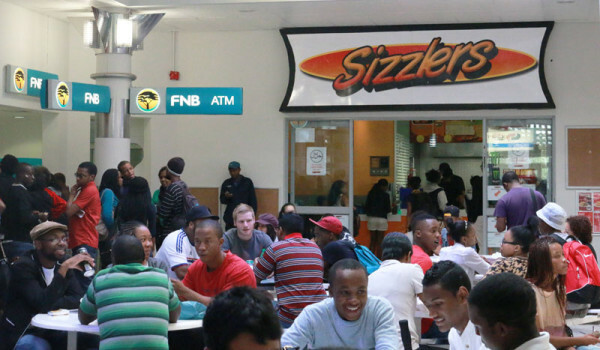 Wits University has no control over the high cost of food at the Matrix as the building is outsourced. The cost of food in the popular student venue is heavily influenced by the high price of rent shop owners are expected to pay to the management company, from anywhere between R8 000 and R38 000 a month. The Matrix – which consists only of the ground floor and banks on the second floor (it makes up one part of the Student Union Building) – is outsourced, according to Director of Services, Theresa Main. This means that shop owners and managers in the Matrix end up paying rent to Micromatica, who privately owns the building, and not the university itself. Wits signed a twenty year contract with the property developer (Micromatica) in 2002 in order to invest, develop and manage the Matrix. Originally created as the Student Union Building, housing the Student Representative Council (SRC), it was meant to bring in revenue for the SRC and although they are making money from it, it is very little in comparison to how much rent shop owners are expected to pay, according to a former SRC member who did want to be named. The sweet shop, situated at the entrance of the building, pays the least amount of rent, according to its manager, Carla, who said “You have to pay rent, then more for the cleaners, staff and buy all of your stock … the rent is very high”. In total, it costs her about R20 000 to maintain her small business, that provides students with cheap cold drinks, chocolates, chips and other basics. Although students only spend a total of about about six months on campus, shops are expected to pay rent for the entire year, with the exception of July and December, when campus shuts down entirely. Rasta, the manager at Sizzler’s, says “my boss is always complaining about how expensive rent is”. It affects the price of their food and shop managers throughout the building are concerned about how expensive it is becoming for students to eat at the Matrix. However, the university needs to cover all bases and maintaining such a large area (with so many different types of food options and requirements) costs money. Wits Services has “invested time and effort into building strong relationships with credible suppliers, adding the ingredient of ‘trust’ into the valued relationships we have with our customers throughout campus”. This is why the university chose to partner with a property developer in the first place, so that all of its needs could be fulfilled, according to Professor Beatrys Lacquet, Deputy Vice-Chancellor of Information, Knowledge and Infrastructure Management. When asked about the increasing cost of food in the Matrix, Lacquet said, “Wits Services Department is very aware of the impact of pricing on food security on campus. As such, our Director of Services engaged in a comprehensive study to determine the impact of such on various levels as well as to determine the best business model for retail operations on campus”. Hiring professionals to do so has continued to be the best solution for the university. Shop owners and managers remain wary of increasing their prices by too much, with the worry that students will choose to eat off campus instead.